HomeRetro plane travel. Ah, the good old days. Retro plane travel. Ah, the good old days. I usually don’t get much value out of so called “news” stories from the Yahoo feeds but I cam across this one today and thought it was really not bad. 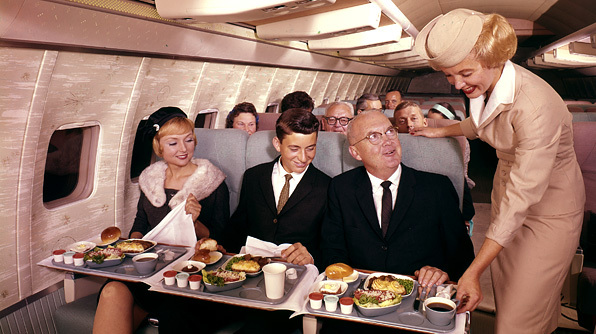 Mostly because of the great retro 747 plane photos. Check it out. I do love first class cabins and didn’t have much chance to travel the old 747’s of the 1970’s but I miss that. Madmen era folks all getting drunk and dressed up to fly to some far off adventure. Seems like glamour. Today some of the international airlines have taken things back to the level but at the expense of the space in Coach on the big A380s or 77W’s. ← Rebuilding Kansas City International Airport? I wanna look that glamorous when I travel!